Key for identification of larvae feeding internally in apple. Tree Fruit Pests of the Month! Identification of spiders collected in Virginia apple orchards. A European site has biological information on spider families that are common in orchards in eastern North America, e.g. salticids, thomisids, and araneids in the canopy, and lycosids in the ground cover. Identification of Orchard Ground Beetles (carabids) in Virginia apple orchards, with information of their role as predators of fifth-instar codling moth (Riddick & Mills). Effect of organic conversion on carabids. Control Recommendationsontrol Recommendations (Use caution, because pest species and recommended controls vary regionally. Recommendations for commercial use and home use are made separately for specific reasons. Many pesticides used by commercial growers require applicators to be certified; these may not legally be purchased or applied by non-certified applicators. Materials recommended for home fruit production are safer for application in the typical homeowner environment.). 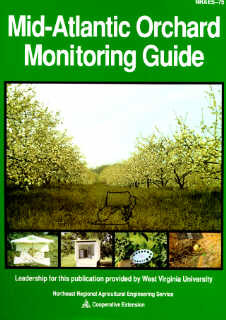 Information on organic pest control. Washington State University page on codling moth mating disruption. Virginia Tech's Apple Crop Profile by Tukey et al. (2000).